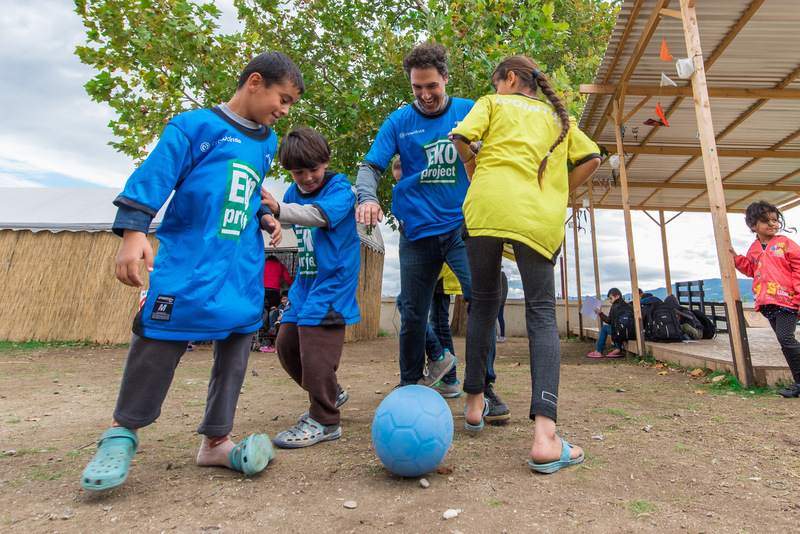 Ethan and Lisa Zohn are in Greece as part of the CrowdRise 24-Hour Impact Project. 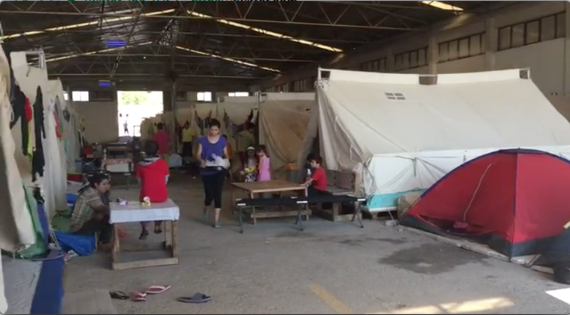 They've launched a fundraiser and have 24 hours to raise $20,000 to improve lives in a Syrian refugee camp. This is their story. Vasilika Refugee Camp, Thessaloniki, Greece - The term honeymoon typically conjures images of beautiful beaches, swinging hammocks and champagne glasses clinking with the sun setting on the horizon. This honeymoon is none of those things. Since being married in July, Lisa and I had been contemplating what to do for a honeymoon, but we were stumped about where to go and what to do. I then came up with the idea of a charitable honeymoon, and Lisa was immediately in - which is exactly why I married her. This charitable honeymoon in mind, I contacted some friends at CrowdRise where I learned about their 24-Hour Impact Project. In this program, CrowdRise ambassadors are selected to find an important cause and in just 24 hours raise the funds to make a change. They then spend the following 24 hours implementing that change. All activity is filmed in real time and video updates are posted so that donors can see the immediate result of their contributions (examples have been a homeless community, a group of students, an endangered species and even an entire village). 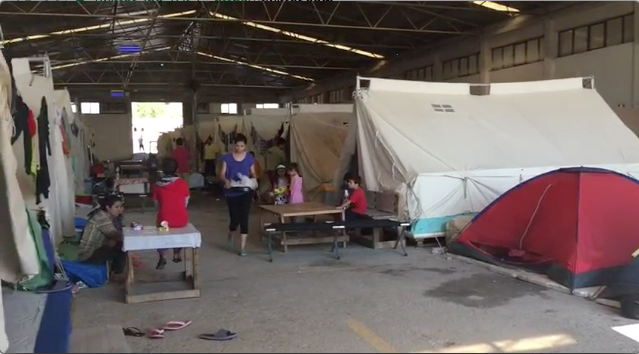 Lisa and I decided to join the 24-Hour Impact Project and help them improve the lives of 1,200 Syrians living in the Vasilika refugee camp in Greece. Since winning Survivor and surviving a rare form of cancer, my life has been laser focused on helping to make happiness real for others. I have been fortunate enough to travel the world and immerse myself in many different humanitarian efforts...but nothing could have prepared us to meet hundreds of families that had to flee their home country and cross the border looking for a better life. Many had spent their life savings to reach Greece by boat. Many of their husbands and fathers had ventured in earlier months to Europe and would hopefully send for them. But when Greece's borders closed, the families were separated. And now these people remain stranded in a country that is not their own. I'll admit that I was really nervous. I was most afraid of feeling like we couldn't do enough and the need would be so great as what we thought. As we approached the camp, I was quite surprised. To be honest, from the outside it looks like a huge indoor soccer facility, the kind you see stationed in a warehouse on the outer city limits. As we got closer, things started to change and I couldn't believe what I was seeing. It was more like six giant abandoned warehouses, converted into barracks, positioned back to back to back. A barbed wire fence surrounds the structure and a muddy dirt road leads to a small entrance, guarded by armed Greek police. Inside there are rows and rows of canvas tents with rusty old cots. There's no heat. They rely on outhouses. Food is scarce and mostly consists of packaged bread and apples. It's a horrible situation made worse by the never-ending rain and fast approaching winter. We aren't legally allowed inside the refugee camp, but a young girl named Helena snuck us in through a hole in the barbed wire fence. The idea of going to jail on my honeymoon was definitely not on the itinerary. But Helena wanted us to meet her family. We made our way to Helena's tent and waited outside while she surprised her mother with her new American friends. We stepped out of our shoes and stepped inside. Her mother was under the covers on one of the four cots lining the tent. She reluctantly got up, coughed a deep cough and pointed to her throat. We could see she was ill and frantically searched our pockets for lozenges which we gave her but she put aside. Helena was searching under the cots for something to offer us and she discovered the stash of Nescafe but sadly upon opening the lid, there was barely a tablespoon of powder left. Her mom quickly put it away and we talked as best we could with Helena translating. As we said our goodbyes, her mother heartbreakingly asked us to take Helena back with us to America. This is the reality of the refugee crisis. But there are some bright spots, too. Next door to the camp is a safe-haven for the kids called Eko Project. A group of volunteers from Spain built a school, library, play space and kitchen that serves fresh, healthy and warm food. The kids run around and play soccer every day (I played professionally, so this was amazing to see). They are adorable, but behind their smiles and step-overs there is definitely pain. Seeking a way to help, I knew that I could communicate through the beautiful game. As I was meeting refugees of all ages, from all different countries, speaking all different languages, I desperately wanted them to feel comfortable with me. So, I started kicking a soccer ball and calling myself Messi. It was the greatest opening line ever. On the soccer field, there is always a battle and lines that are crossed every minute of the game. Every soccer fan understands that the lines on the field are a general strategy to position players at the start of game, but once the referee blows the whistle, like a siren, players are free to roam wherever they want. There is a sense of freedom when you play soccer - a player can sprint, kick, rest, talk and celebrate wherever they want, whenever they want and on their own volition. It's their personal choice and they have the freedom to make those choices. Yes, there are consequences when a defender makes a streaking run up the center of the field, attacks the far post and attempts to rifle a shot from the six-yard line - but the consequence of that potentially failed mission is not jail...or even worse...being sentenced to a life in a country that is not your own. On the soccer field there are lines to be crossed, but no borders preventing you from crossing them. When we stepped out of our car at Eko we were immediately welcomed by a little girl dressed in pink and green with a striped hat and matching scarf. She held out a hand full of sunflower seeds and made sure we each took one before she hugged all of us and said, "my loves." I was already holding back tears at the sweetness of this one little girl. We soon discovered that there were so many more kids just like her...just normal, everyday kids. They just want to play, they want you to watch them try a soccer ball trick, they want you to push them on a swing, they want you to care about them. We were quickly surrounded by kids. Which meant that it was time to organize a quick pick-up match. The first team to hit the post wins. The starting line-up consisted of an American Jewish soccer guy (me), Iraqi war vet and Syrian truck driver to square off against a Turkish professor, a Spanish volunteer and a Palestinian store owner. 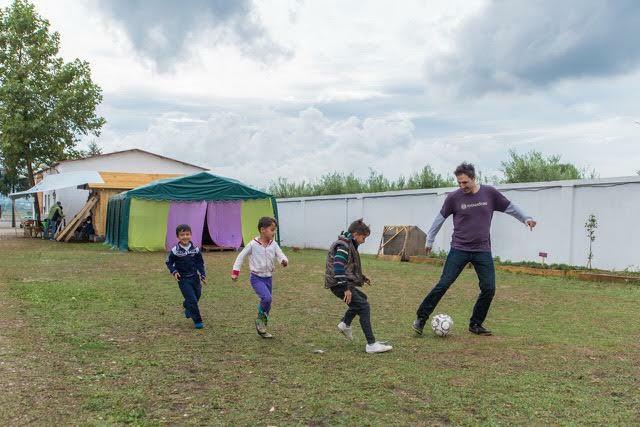 Filling out the roster was Helene, her little sister Elene, Slava and her sister Sidra, then there were the boys, Mohammed, Mohammed, Mohammed and Mohammed along with 25 other refugee kids swarming around us frantically trying to get a touch on the ball. Aras, Mohammed x 4 and I worked together like a well-oiled machine, gunning crisp passes around our opponents. Aras was calmly smoking a cigarette and nutmegging the kids at the same time. He made a note to tell me that he didn't smoke in Iraq, but the stress and boredom in Vasilika got him hooked. David, the Spanish volunteer managing The Eko Project, blasted a shot off Helene's knee which ricocheted into the cinder block goalpost and the game was quickly settled. The kids cheered and the older folks were happy to stop running. I can't say that playing the beautiful game with these kids helped them forget the reality of their situation, but I can say that this bright, brief moment with them did make them smile and help them feel free...even if it was just for a minute. Even though we couldn't speak the same language, we could all communicate, have fun, become friends and share an incredible moment. Simply arriving with a soccer ball granted us instant access into the community, broke down cultural stereotypes and brought people together. That's what a ball has the power to do. We've heard about refugees all over the news...but being here...our heart is in it. These are innocent people who are desperately seeking their human rights. We saw the news stories before, but now these are our friends. And that's why we're so thrilled to be doing the 24-Hour Impact Project to raise awareness and funds to keep Eko Project and this soccer program thriving. This is just a small sample of the people we've met, the stories we've heard and the things we've seen. We now need your help to reach our goal of raising $20,000 to assist these amazing people while they're here.